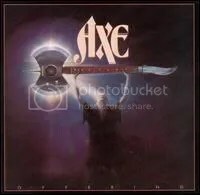 With a band name like Axe and an album cover like Offering‘s you’d expect something pretty heavy, but instead Axe is just a good hard rock/AOR band. Not that there’s anything wrong with that. I knew what I was getting into anyway because I had heard “Rock ‘N’ Roll Party in the Streets” on Dee Snider’s House of Hair radio show while still in high school and it quickly became a favorite song of mine. Fast foward a few years and I was talking to a co-worker about Axe and he suggested I check out Offering. As luck would have it, about that time it was recently reissued by Wounded Bird Records so I snatched it up from CDUniverse.com for a good price. Top to bottom, I really enjoy this album. It’s been about 3 or 4 years since I last listened to it, but I broke it out again on a whim and I’m digging it all over again. “Steal Another Fantasy” is a hard rock/AOR classic and I love the vocals on it and it reminds me of a few XYZ & Rainbow songs. “Rock ‘N’ Roll Party in the Streets” would be the album’s highlight for me, but the band does a great job on covering Montrose’s “I Got the Fire” and it’s the most energetic song on the album.